Productivity. It’s practically the defining word of our age. Everything must be “productive” in 2019, from our main lines of income to our side-hustles to even our leisure time. It’s gotten to the point that now when we’re having a fight with a loved one, we call the conversation “unproductive” when it gets out of hand. Because of this, countless books, articles, and listicles have been written on the subject of productivity, more than you could ever read and still be “productive” in any area of your life, much less all of them. Don’t worry, though—here at Salons de Beauté, we’ve done the heavy lifting for you. We’ve read the articles, we’ve perused the books, and we’ve put together the top five ways to make your workdays at your salon suite in Lawton more productive than you could possibly imagine. Read on! It’s not easy, but planning out your days the night before is one of the most often recommended tactics for increased productivity. We know, we know. Most of the time when you get done with your day at your salon in Lawton, you just want to clean up, close up, and go home to chill on the couch with a glass of wine and the next episode of your current favorite Netflix Original. But if productivity is on your mind, try taking just 15 minutes at the end of the day, after you’ve turned the OPEN sign to CLOSED and locked up, to think about what you need to do the next day. Open up your planner or your calendar app, read over your appointments, make a little list of any errands you need to do that you shouldn’t forget about, such as ordering or sales tax, and then head home, knowing you’re prepared for whatever tomorrow brings. Preparing yourself the night before also makes it easier for you to stick to healthy goals, such as hitting the gym or eating breakfast, instead of using your morning time scrambling to play catch-up. It might sound pretty basic, but the to-do list is one of the most powerful tools of highly productive people. It’s simple, specific, and effective because it not only helps you keep track, it helps you prioritize by moving things up and down the list. It also helps you keep your mind where it needs to be. By updating tomorrow’s list at the end of your day—just like we were saying above—you allow your mind to leave work where it belongs and enjoy your much-needed personal time. It’s also fun and satisfying to cross things off! Commit to a to-do list. You can do it on paper, or you can use a to-do list app on your smartphone. It doesn’t matter how you do it; just do it, and do it every day. If that sounds excessive, think about it this way: Isn’t it easier to get to the gym when you do it every day? It’s when your schedule becomes irregular that it suddenly seems so much harder to pull on the gym tights and hit the elliptical runner for half an hour. Make to-do lists a daily practice, continuing it even on calm days. That way you’ll be in the habit of it when things get hectic, as they always do. And really, if a to-do list is basic, then why is it so hard for most of us to remember to write things down? This one you may not have heard before, but as crazy as it may sound, it has real value. Scheduling two hours into your day at the start of each week to take care of some piece of onerous busy work that needs to be completed is one of the best habits you can get into to up your productivity. Why? Well, we all know how easy it is to put off things such as writing all your social media posts for the week, balancing your checkbook, ordering product into your salon, or sending reminder emails or thank you cards to your clients. In fact, we’ve talked about that here on this blog before! By reserving 8-10 AM on Monday morning (or whenever) for completing some specific, unpleasant task, you’ll get it out of the way first thing, and it’ll be in your rear-view mirror all week. You’ll feel good about having it done rather than letting it loom over you. And it’ll free up your mental space to devote to other things! Your time is precious, so remember that during the workday, you need to be focusing on business and clients. Even if you have a free hour from a no-show, devote that time to your business. Don’t answer the phone. Don’t check your personal email. Don’t put something off to go have lunch with a friend. And stay off social media, especially your personal social media! FOMO (Fear Of Missing Out) is real, but so is the fact that there are only 24 hours in the day. Use them wisely. If there’s a more popular buzzword for 2019 than productivity it’s boundaries. But really, boundaries are so important. Set them and guard them. And while this is great advice for your personal life, especially as it regards that one friend or that former lover, it’s also great advice for your business. Balance is key for those who own their own mini salon suite. You have to be able to leave your work at work. After you close up shop, that’s your time—time for you, your friends, your family, whatever. You must give yourself time off in your hours off. 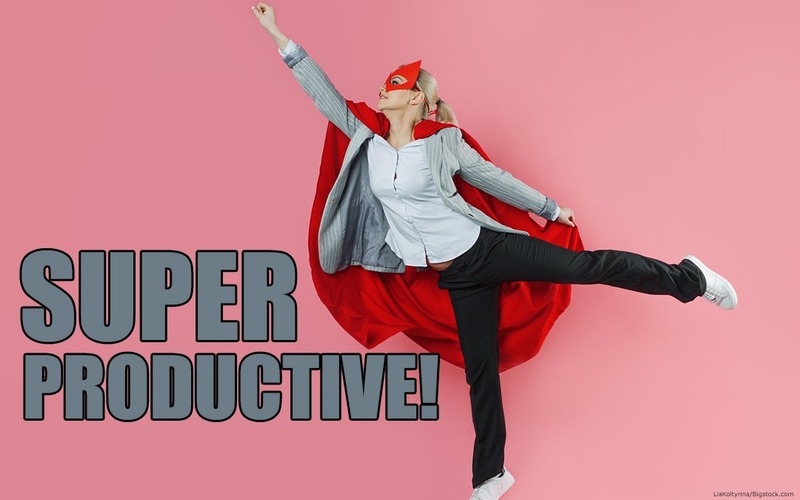 You’ll be more productive in the long run if you allow yourself to be unproductive sometimes! Salons de Beauté leases mini salon suites to stylists and beauty industry workers of all sorts. Contact us today and find out how we can help you make the most of your salon!